British archaeologists searching for the grave of Richard III have said “strong circumstantial evidence” points to a skeleton being the lost king. A dig under a council car park in Leicester has found remains with spinal abnormalities and a “cleaved-in skull” that suggest it could be Richard III. The University of Leicester will now test the bones for DNA against descendants of Richard’s family. Professor Lin Foxhall, head of the university’s School of Archaeology, said: “Archaeology almost never finds named individuals – this is absolutely extraordinary. Richard III is recorded by some sources as having been pulled from his horse and killed with a blow to the head. Although not as pronounced as Shakespeare’s portrayal of the king as a hunchback, the condition would have given the adult male the appearance of having one shoulder higher than the other. Philippe Langley, from the Richard III Society, said: “It is such a tumult of emotions, I am shell-shocked. As the defeated foe, Richard III was given a low-key burial in the Franciscan friary of Greyfriars. This was demolished in the 1530s, but documents describing the burial site have survived. The excavation, which began on 25 August, has uncovered the remains of the cloisters and chapter house, as well as the church. Work focused on the choir area, in the centre of the church, where it was indicated Richard was interred. The bones were lifted by archaeologists wearing forensic body suits in an effort to limit contamination by modern materials. DNA will be extracted from the bones and tested against descendants of Richard’s family. Dr. Turi King, who is leading the DNA analysis, said: “It is extremely exciting and slightly nerve-wracking. The tests are expected to take about 12 weeks to complete. 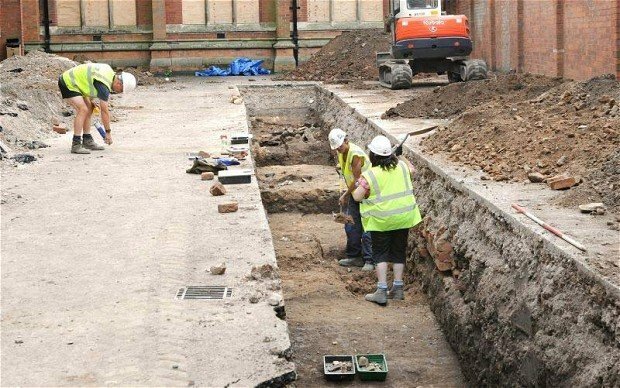 If their identity is confirmed, Leicester Cathedral said it would work with the Royal Household, and with the Richard III Society, to ensure the remains were treated with dignity and respect and reburied with the appropriate rites and ceremonies of the church. Work to record the finds are continuing and discussions about when to fill in the trenches are ongoing, officials said.